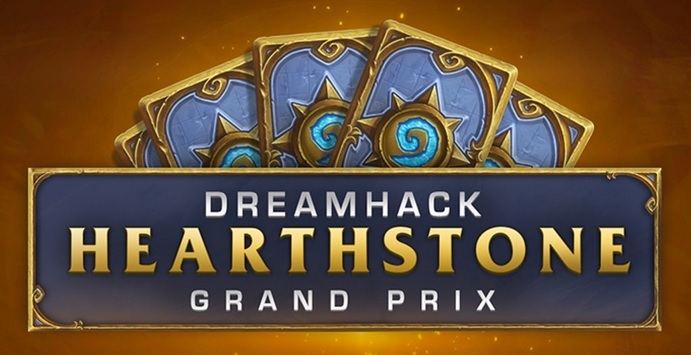 Dreamhack Denver 2017 Hearthstone Grand Prix was played from 20th to 22nd October 2017 in Denver, USA. 182 players had signed up for this open LAN tournament that consisted of nine rounds of Swiss followed by single-elimination top-16 playoffs. In this post, I take a look at the decks and results of the tournament, including class distribution, archetypes, and archetype performance. The event was played in a best-of-five Last Hero Standing format with one ban. Decks were secret during Swiss, but published for the top-16 playoffs. First, the players went through nine rounds of Swiss to determine the top-16 cut for single-elimination playoffs. After nine rounds, Ike was the sole undefeated player, followed by Shoop and Earl at 8-1 and 13 players at 7-2. 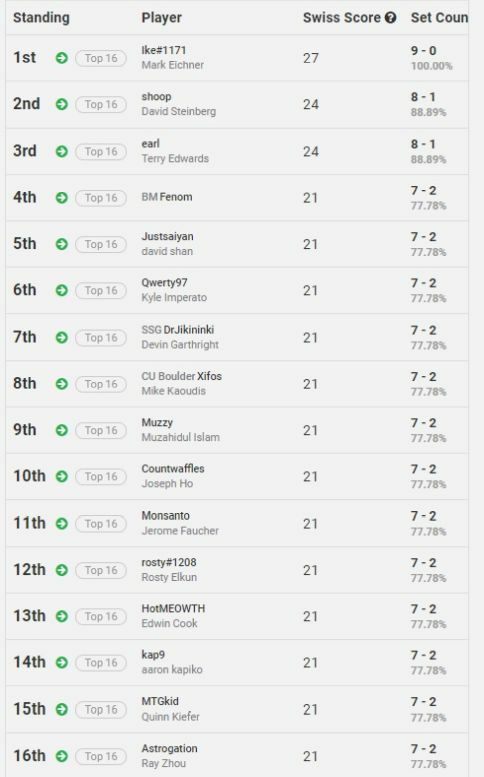 This time the Swiss system worked like a charm, resulting in a clean top-16 cut at 7-2: everyone with 7-2 or better made it to the playoffs and that was it. It is notable that for a children’s card game, Dreamhack Denver top-16 featured the youngest player in Hearthstone history to make it so far in a major tournament: MTGkid, Quinn Kiefer, achieved this feat at the age of 12 years. Kiefer, alongside his two older brothers, has played in Magic: The Gathering tournaments for years, and now played his first Hearthstone tournament when the circuit came to his native state. Druid, Priest, Rogue. I guess this cannot come as a surprise to anyone who has followed the recent Hearthstone meta. The triumphant trio continues to dominate the meta. What happens behind them is more interesting. Warlock climbed to the fourth place, overtaking Shaman. Paladin was surprisingly unpopular, and Warrior came crashing down – only 8 people out of 171 trusted in the Warrior class, marking a new low for the traditional staple class that once had viable decks in all archetypes (aggro, midrange, control, combo). Hunter was the only class less popular than Warrior, and only by a hair. The story does not change much for the top-16. Rogue outperforms Priest as the class is more difficult to target. Warlock holds its spot, its newfound popularity backed up by solid performance. Shaman, however, crumbles. No Hunters make it to the top, but a lone Warrior reaches top-16. Tempo Rogue did it! With 136 players opting to bring the deck, it was the most popular archetype at Dreamhack Denver ahead of Jade Druid (132) and Kazakus Priest (124). While the dominant trio remains the same, we are witnessing a shift in the tournament meta nonetheless. Tempo Rogue pulled ahead even more when it comes to reaching top-16: 15 Tempo Rogues, 12 Jade Druids, and 11 Kazakus Priests. Furthermore, in top-16, Tempo Rogue was by far the most common ban target (11 bans), showing the respect for the power of the deck. Behind the three leaders, the fourth spot was a draw between Zoolock and Evolve Shaman with 60 players opting to bring each. Zoo is back, and it’s back big time. Whereas Evolve Shaman faltered on the way – only two of them reached the top-16 – Zoo was a solid performer with eight decks in the top-16, which was a significant increase in representation. Murloc Paladin carried the Paladin torch with 39 decks in the tournament, of which four reached the top-16. It remains a solid performer, especially when combined with a Rogue ban, which was also the strategy that Surrender used in the (Conquest format) Summer Championship a week ago. If you’re looking for diversity, look no further than the Mage class. There were seven variants of Mage in the tournament, and four different variants made it to the top-16: Burn Mage, Exodia Mage, Giants Quest Mage, and Secret Mage. Mage is a versatile class that you can tune to your liking and play in any style. This makes Mage difficult to mulligan for when decks are not public, but can hinder its relative performance when the opponent knows exactly what you are playing. In top-16, Mage went 1-3 overall, but it also picked up a fair few bans (4 bans). Going Big was one of the themes of Dreamhack Denver. While Big decks were not that common, both Big Priest (14 players) and Big Druid (13 players) were among the ten most common archetypes brought to the tournament. As three Big Druids and two Big Priests reached the top-16, both archetypes also succeeded above the average. Going Big was an alternative to the expected Jade Druid and Kazakus Priest, and in part contributed to Tempo Rogue becoming the most common archetype. There is also a story to be told about N’Zoth Control Warrior. 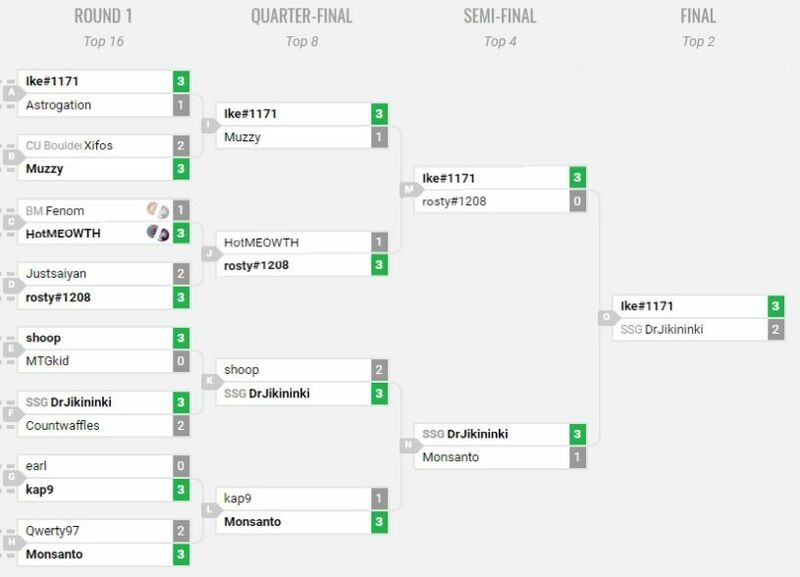 Monsanto was the only player who brought the archetype to the tournament, and he took it all the way to the top-4. This complements the strong performances of the archetype in all recent major tournaments: despite being brought by only a few players, there has been a N’Zoth Control Warrior in the top-16 of the four latest major tournaments. Hidden behind all the Zoo hype, Rosty quietly piloted a Control Warlock – a double Twisting Nether build, even – to the top-16. Overall, four classes (Druid, Priest, Mage, Warlock) had more than one archetype present in the top-16. There is also considerable variety in Tempo Rogue builds: Corpsetakers, Elementals, Bittertide Hydras, and Cobalt Scalebanes all reached top-16. The meta is in large part dominated by three decks, but there are niches for others and variations within those three decks when you take a closer look. No other lineups were brought by more than three players. Overall, 83 different lineups were brought to the tournament. It must be noted that Dreamhack is an open tournament, and many of the lineups at the bottom of the standings had no real chance to succeed. There are not that many archetypes with a good shot at glory, but with Big Priest and Big Druid becoming more commonplace, there are many ways to create combinations of four decks as the first two slots are no longer set in stone. There were 13 different lineups in the top-16! Now, plenty of same decks appeared. For example, the trio of Jade Druid, Kazakus Priest, and Tempo Rogue appeared in nine of the top 16 lineups. Ike’s winning lineup of Jade Druid, Kazakus Priest, Tempo Rogue, and Burn Mage was brought by three players. In addition to Ike, it was brought by Qwerty97 (top-16, 7-2 in Swiss) and Broshy (#30, 6-3 in Swiss), so it was very successful overall in this meta. However, it is not all about lineup. DrJikininki, the runner-up, brought Jade Druid, Kazakus Priest, Tempo Rogue, and Zoolock – as did 18 other players! It was the second-most common lineup in the tournament, but DrJikininki was the only one who piloted it to the top-16. Tech cards within the archetypes can of course play a role, but it is still also a matter of piloting skills. Last Hero Standing format tends to promote some unusual deck choices: If something you bring to a Conquest tournament does not quite work, you’re gone. In LHS, however, you can use decks to target specific decks very hard and still be OK even if your opponent does not have that deck in their lineup, and you can also bring decks that have good potential to win multiple games, even with some risk. Dreamhack Denver did not disappoint. There were lots of great decks in the top-16, and here is a selection of the most interesting and powerful ones. Mage is a class that sees a lot of variety. There were Quest Mages with Giants or the OTK package, Secret Mages, and slow, grindy Control Mages with Frost Lich Jaina. Ike, on the other hand, stuck with some basics, bringing a straightforward Mage list with a lot of burn in it. Freeze Mage, Hybrid Freeze Mage, Burn Mage, the list can be called many names. The deck plays out in a fashion similar to classic Freeze Mage with a ton of freezes, double Ice Block, and Alexstrasza to set the opponent to low health to be burned down. However, it also incorporates some minion pressure in the form of two Mana Wyrms, two Firelands Portals, and Medivh, the Guardian. Therefore, it has more alternative pathways than Freeze Mage used to have, at the expense of some card draw. 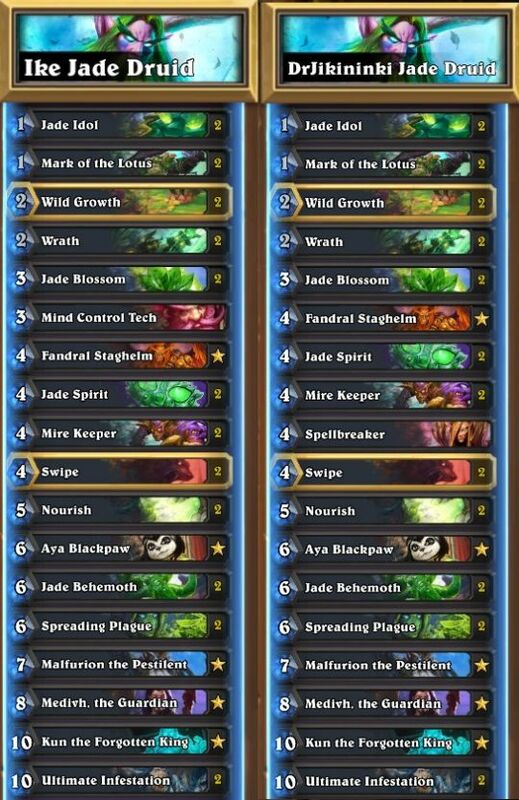 Mark of the Lotus builds of Jade Druid are growing in popularity. Especially Casie has been a vocal proponent of the build for weeks, and it is no surprise that both Ike’s and DrJikininki’s lists closely mirror Casie’s build: Ike opting to include a Mind Control Tech and DrJikininki a Spellbreaker in the only tech slot (Casie’s build runs a Power of the Wild). At the recent HCT Summer Championship, Surrender was the only one who brought this build – the exact same list as DrJikininki, in fact – and he went on to win the whole tournament. There is a lot of power in Mark of the Lotus together with Spreading Plague (and with minions on board in general), and Medivh adds some extra end-game punch and tempo to the Ultimate Infestation turn. Zoolock has rejoined the metagame with a bang. 60 players brought some variant of Zoolock to Dreamhack Denver, and the one who went the furthest, all the way to the finals, was DrJikininki. The current iteration of Zoolock has pressure for days. Between Prince Keleseth, Pirates, Vicious Fledglings, and of course Demons that come back from Bloodreaver Gul’dan, there are plenty of threats in the deck. DrJikininki’s list even includes Cairne Bloodhoof and The Lich King for even more pressure. Cairne is living a revival and keeps finding itself in new decks: with the meta a tad slower than before, Priest being popular and unable to effectively deal with four-attack minions, and the huge prize of landing a Bonemare buff on turn seven, Cairne just fits the bill of many midrange decks. Running discard mechanics alongside The Lich King and Bloodreaver Gul’dan can sometimes get a little messy, but should Gul’dan bring those Doomguards back from the dead, the effect is often game-winning. In the best case, the Warlock player can play their Doomguards before drawing Gul’dan at no risk, but sometimes the risk has to be taken or Doomguard saved until after Gul’dan. This adds a random element to the deck and playing for the highest percentage odds to win more in the long run is crucial. N’Zoth Control Warrior has got to be one of the most underappreciated decks in Knights of the Frozen Throne. In large tournaments, you often see a couple of players bring it, do well, and it always fails to pick up in popularity. TerrenceM Dreamhack Montreal top-16. Squid HCT Americas Summer Playoffs top-10. OldBoy HCT Summer Championship top-8. Each of them went against the grain and brought N’Zoth Control Warrior. For Dreamhack Denver, Monsanto was the only player in the entire tournament to bring the deck, the sole standard-bearer of the archetype amongst more than 170 players, and it was beautiful. N’Zoth Control Warrior runs one copy of Dead Man’s Hand, but fatigue is just one of its win conditions and it is not planning to make its cards last forever. Dead Man’s Hand’s primary purpose is to give a second copy of N’Zoth the Corruptor, and thus summon two big boards of Deathrattle minions. It can also be used to add additional armor gain or removal to the deck, if needed. The standard Deathrattle package consists of two copies of Mountainfire Armor and two copies of Direhorn Hatchling. Should the opponent clear boards full of them, the Warrior gains plenty of armor and shuffles a number of 6/9 Taunt minions into the deck. Generally, other Deathrattle minions are avoided in order to not interfere with the powerful synergies these cards provide both offensively and to a fatigue gameplan. There are two main ways to build a Quest Mage. Either you go for the infinite damage combo with Sorcerer’s Apprentices and Archmage Antonidas and build it as Exodia Mage, or you put in some giants in it and smash face by hand instead of by magic. The giants version does not sport an infinite damage combo, so its assault can be outlasted or stopped, but on the bright side, it can unleash a fearsome assault without completing the quest: it can even mulligan the quest away against aggressive decks and try to beat them through removal, Ice Blocks, and 8/8 minions. Tars piloted a version of the Giants Quest Mage to a top-8 finish at Dreamhack Montreal, and Shoop brought a slightly modified version to Dreamhack Denver, again grabbing a top-8 finish with the build. A deck that excels in Last Hero Standing, Giants Quest Mage is something to keep in mind in these types of tournaments. Ez Big Ez Druid Ez. Once half a meme and the favorite deck of Ostkaka, Big Druid now found itself well-positioned in the meta and three players piloted very similar lists to top-16 (Muzzy, Astrogation, and Fenom). The current iteration of the deck targets both Jade Druid and Kazakus Priest by going big and doing so largely with dragons, even including Malygos that is a pain to remove as a 4/12 Dragon and that threatens some significant spell damage. Big Priest is more than a turn four Barnes pulling Y’Shaarj, even if that is the most iconic sight associated with the deck. Fitted with a large suite of removal and big minions that refuse to stay dead, it is a formidable opponent to any deck. Even if Priest fails to find Barnes, it has enough removal and healing to stay in the game, and Shadow Essence gives it another chance to get a big minion on the board at six mana. If there is not enough pressure, it can even play its minions the old-fashioned way, at their regular mana cost, and still stand a chance to win the game from there. While Zoolock is getting most of the attention, Rosty brought a removal-heavy Control Warlock build to the tournament: two copies of Twisting Nether and a Skulking Geist. This is a deck that can defend against aggression for ages and eventually just run the opponent out of resources. It is not altogether without pressure, though, as Bloodreaver Gul’dan resummons a number of demons (2xVoidwalker, 2xDespicable Dreadlord, 1xAbyssal Enforcer) – numbers that can be bolstered by the presence of Lord Jaraxxus, which can create further 6/6 Demons ready for resurrection, should pressure be needed. Bans: Ike banned Big Druid and Astrogation banned Tempo Rogue. Ike 3 – Astrogation 1. Bans: Xifos banned Tempo Rogue and Muzzy banned Tempo Rogue. Xifos 2 – Muzzy 3. Bans: Fenom banned ? and HotMEOWTH banned Tempo Rogue. Fenom 1 – HotMEOWTH 3. Bans: Justsaiyan banned Control Warlock and Rosty banned Jade Druid. Justsaiyan 2 – Rosty 3. Bans: Shoop banned Tempo Rogue and MTGkid banned Tempo Rogue. Shoop 3 – MTGkid 0. Bans: DrJikininki banned Tempo Rogue and Countwaffles banned Kazakus Priest. DrJikininki 3 – Countwaffles 2. Bans: Earl banned ? and Kap9 banned ?. Earl 0 – Kap9 3. Bans: Qwerty97 banned ? and Monsanto banned ?. Qwerty97 2 – Monsanto 3. Bans: Ike banned Big Druid and Muzzy banned Burn Mage. Ike 3 – Muzzy 1. Bans: HotMEOWTH banned Secret Mage and Rosty banned Jade Druid. HotMEOWTH 1 – Rosty 3. Bans: Shoop banned Tempo Rogue and DrJikininki banned Tempo Rogue. Shoop 2 – DrJikininki 3. Bans: Kap9 banned Tempo Rogue and Monsanto banned Big Priest. Kap9 1 – Monsanto 3. Bans: Ike banned Secret Mage and Rosty banned Jade Druid. Ike 3 – Rosty 0. Bans: DrJikininki banned Tempo Rogue and Monsanto banned Kazakus Priest. DrJikininki 3 – Monsanto 1. Bans: Ike banned Kazakus Priest and DrJikininki banned Burn Mage. Ike 3 – DrJikininki 2.